Nature Will Heal Your Restless Legs …. be Patient! Unlike drugs, nutrients do not have rapid effects. There’s NO QUICK fix! The business of nutrition is to BUILD a better body. That has to wait on Nature to turn over body cells. A blood cell lasts 60 to 120 days. In 3 to 4 months your whole blood supply is completely replaced. In 6 months almost all the proteins in your bones die and are replaced … even the DNA OF YOUR GENES. In a year all your bones and even the enamel of your teeth is replaced. This time curve is well illustrated by the course of deficiency diseases. If I remove the Vitamin C from your diet, within 4 weeks your blood Vitamin C will drop to zero. But, you will see no symptoms of disease at 4 weeks. You have to WAIT until enough of the HEALTHY cells have been REPLACED by unhealthy cells. 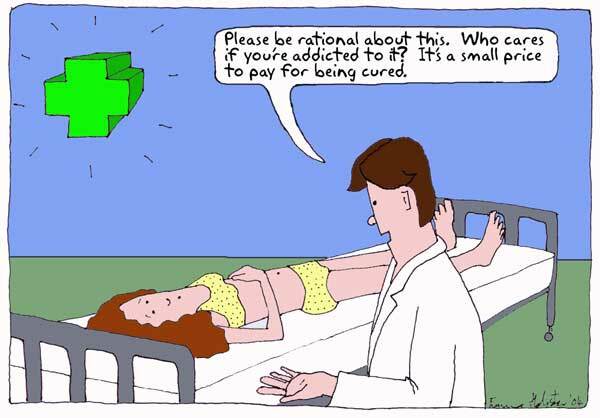 It is ANOTHER 12 weeks before the symptoms of scurvy start to ravage your body. Think of it this way, If you take a neglected house plant and start feeding and watering it, the leaves may PERK UP a BIT from the improved nutrition. But you have to wait for the OLD leaves to die off and NEW leaves to grow before you get a really HEALTHY plant. It is the SAME with the human body. When you start feeding it better, you have to wait on your body to grow NEW improved cells. To understand the difference between drugs and herbs, let’s focus on how they work. Pharmaceutical drugs are highly purified, potently concentrated chemicals which act by blocking processes of the body. This often gets rid of the symptoms but may create undesired side effects. Anti-congestants will clear your nose, but cause drowsiness. Prolonged use of non-steroids temporarily ease your arthritis pain, but may adversely affect your liver. When we drink a tea or take a tincture of an herb, we are taking in the whole plant, with thousands of compounds. Although plants contain unique ingredients which give them specific effects, it is the COMBINATION of all these compounds that accounts for a plant’s effectiveness and safety. The concept that a plant is more than the sum total of all its parts is known as synergy. Synergy means compounds work TOGETHER to boost the power of plants and offset actions of unsafe constituents. In order to get results from herbal treatments it is often necessary to be on a course for several months, especially for serious and/or long-standing problems. Herbs work slowly restoring the body back to balance. 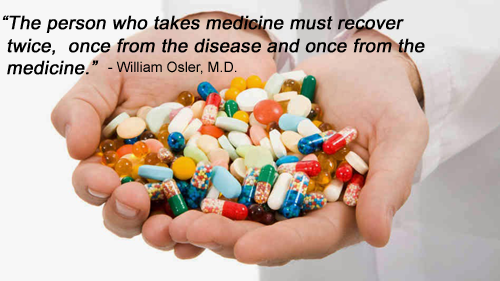 There is no magic quick fix with natural medicine because it has to work at such deep levels within the body systems. The cause of disease in our bodies is often silent. It creeps up on us slowly over time, like a smoldering fire that burns unnoticed till one day we wake up with an illness. Medical research has begun to ask questions about what the common underlying causes are of all these problems that create disease in our bodies. And research is looking into what types of tests we can use to find them and measure them. Chronic inflammation, more accurately known as low-grade or systemic inflammation, is becoming a topic of research to answer questions about the common underlying cause of disease. Chronic inflammation is different from the normal or acute, or short-lived, inflammation that occurs when we have a bruise or cut. In acute inflammation our bodies find the bruise or cut, send chemicals into the area, heal the problem, and then our body goes back to its normal processing. 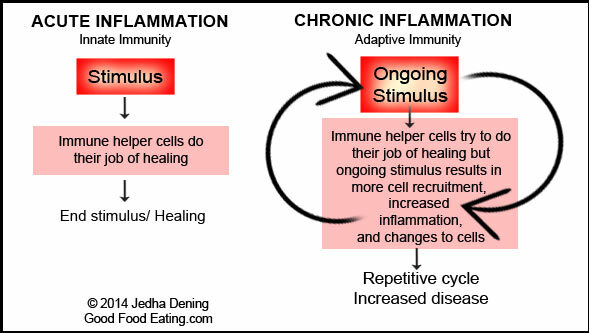 Chronic inflammation is different because the body is not able to shut off the immune response and it continues at a low level, like a fire that is at a smoldering burn for much too long. 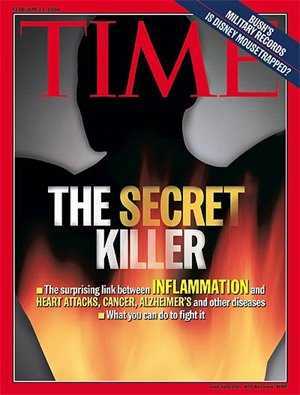 Over time, this smoldering flame can ignite into a major problem or chronic disease. This is when you go to the doctor and you are given the diagnoses of diabetes or high cholesterol, when you thought everything was fine. Perhaps you were not feeling well or you have been having symptoms, but you still are surprised by your diagnosis and you don’t know how to solve this unexpected problem. 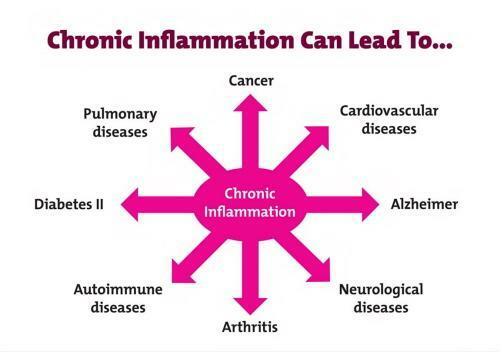 There is no standard treatment for chronic inflammation at this time. There does seem to be a benefit to modifying your eating habits toward an anti-inflammatory diet. This would include eating fruits and vegetables, healthy fats, small portions of nuts, eating fish and consuming very little red meat. 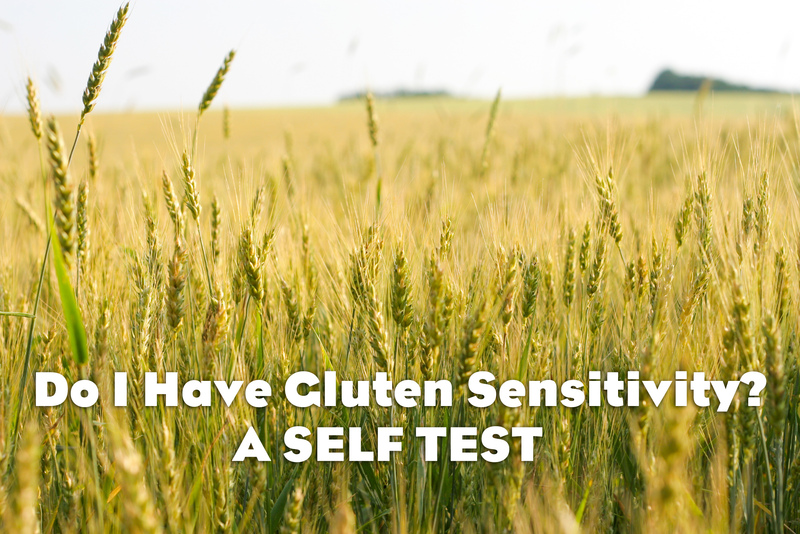 One of the markers for chronic inflammation that can be measured by a simple blood test is homocysteine. This is often measured only in people that have a history or heart disease, but you can request it as part of your normal check up from your doctor. A normal homocysteine level is found between 4.4 and 10.8 micromoles per liter of blood. If yours is higher, this can be a marker of inflammation and can contribute to a host of diseases beyond heart disease. There is an increased risk of Alzheimer’s disease for people with high homocysteine levels, as well. Living healthy is more than just a cool thing to do. It is a way of life that has positive impact because you don’t end up getting sick over time. 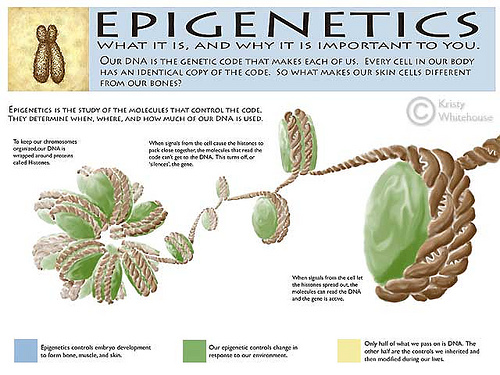 There are thousands of articles online about epigenetics. I found this one to be easy to understand, and will help hopefully explain this new breakthrough discovery and why it’s not only important to people suffering from RLS, but for people suffering from any condition. Epigenetics tells us that whatever hand we believe we’ve been dealt … is changeable. Change the way we look at fitness? Wow, oh wow. Of course I want to write about it instantly, but I can’t because I ended last week’s column with this bit of cleverness: “Come back next week for more happy, hopeful signs that the Healthy Lifestyle Revolution is taking hold and changing our DNA.” I promised. I’m obligated. I feel I must keep my word but now I realize it’s a mistake to end a column with a promise because it keeps me from being seduced by the moment. So epigenetics it is. I’ll write about the Apple Watch next week. 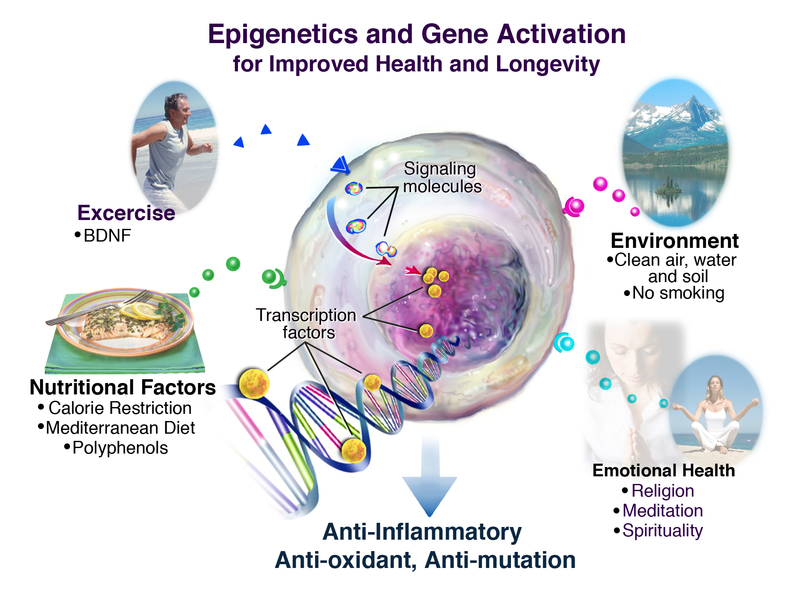 Epigenetics is the next step, the new frontier, the science of changing the way your genes express themselves. Genes can express themselves as disease, or reversal of disease, and the big news is you have much more control over that than you think — if you ever think about your genes at all. “Basically, epigenetics demonstrates how environment and behavior choices can influence our genetic code,” says Dr. Theri Griego Raby, one of a growing number of doctors who see how epigenetics can play a huge role in disease prevention and well-being. Contrary to what many of us learned in school, “genes are not fixed predetermined blueprints passed from generation to generation,” Dr. Raby writes, based on the latest epigenetic research. “Instead, our genome contains at least 4 million ‘switches’ that can be turned on and off by life experiences and environmental influences.” Life experiences! Environmental influences! That’s where you come in. 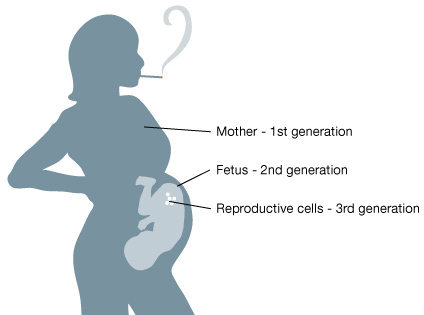 Scientists now have evidence that lifestyle alone — your choice to smoke, to eat real food, to be physically active — can alter the epigenetic markers that sit above your DNA. The above ones have all the say, not just for your lifetime but affecting future generations. I’m wildly oversimplifying, but think about this: Your healthy lifestyle today can predispose your kids and grandkids to greater wellness and a longer life, even before they are conceived! Of course, they then have to make the choices to influence their own genetic code. So let’s delve a bit deeper. “Epi” is a prefix that means “above.” Epigenetics looks above the double-helix 25,000-chromosome genetic code and sees another level of influence: the cellular material that sits on top of the genome and outside it. On top and outside. Get a picture of it. Paint it a color you like. That “on top” and “outside” cellular material is called the epigenome. Scientists aren’t prepared to say how many epigenome marks there are, but the number is well into the millions. Your genes are your genes, but these epigenetic marks tell your genes to switch on or switch off, to express themselves loudly or go mute. If you can manage to mute your colon cancer gene, let’s say, by exercising more and eating clean, real food that doesn’t come in plastic, you’re managing your epigenome in a healthy way. As the biologists like to say, the genome is the hardware, and the epigenome is the software. And to a large extent, you are the epigenome software programmer in charge. It’s not all fixed and predetermined. Your choices really do matter. So what can you do to help your genes behave? Plenty. “How we sleep, the types and levels of stress we experience, the type of foods we eat, toxin exposure, alcohol, and lack of exercise can all alter our genetic makeup during gestation, early development, and throughout adulthood,” Dr. Raby says. “For example, consuming foods rich in gene-altering methyl groups like non-genetically modified soybeans, red grapes, or green tea may protect against disease by deactivating detrimental gene ‘switches.’ ” Enough for today. 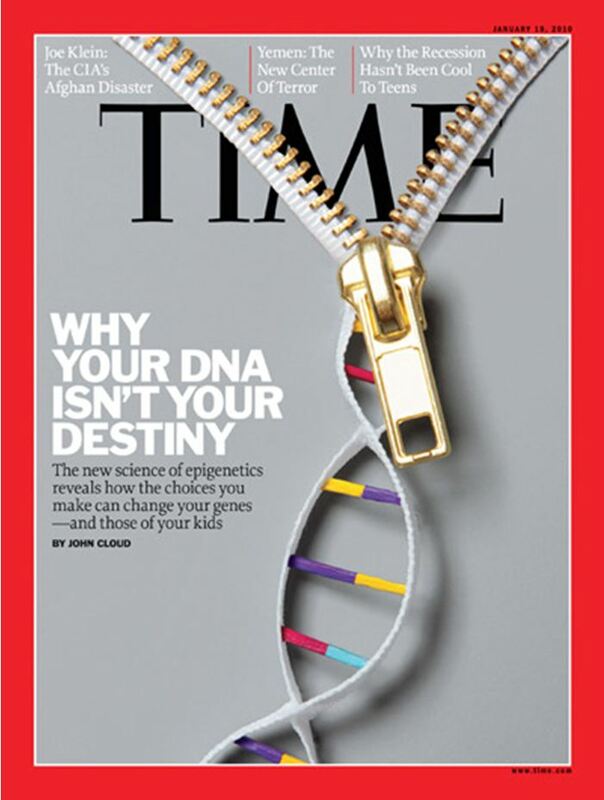 I welcome you to research more on your own, but know this: Your DNA isn’t your destiny. There is wiggle room, and the sooner you start to shake things up, the better. Researchers were initially baffled by patients with restless leg syndrome. Some thought that the disorder could be linked to the nervous system or even caused by a muscular disorder. Restless leg syndrome causes feelings of throbbing, pulling, creeping, unpleasant sensations in the legs that cause an uncontrollable urge to move them. Symptoms primarily occur during the night, and most patients report that moving their legs relieves these symptoms. Doctors were most confused as to why relaxation seems to activate restless leg symptoms. 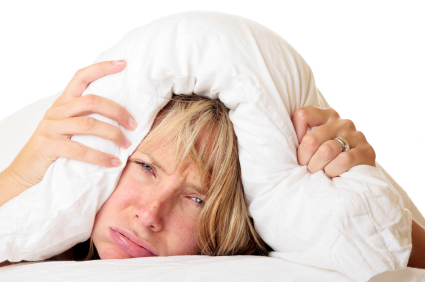 Patients often become frustrated, as sleep cycles are significantly disturbed, affecting quality of life throughout the day. It’s estimated that 10% of the population suffers from restless leg syndrome, and in most of these cases – the causes remains unknown. Past studies have linked restless leg syndrome to genetic factors, the inability to process a neurotransmitter called dopamine, medications, pregnancy, iron deficiency, and specific chronic diseases. However, more recent studies seem to focus more on the role of inflammation in restless leg syndrome. There seems to be a pattern, as restless leg syndrome is more common in those with conditions like chronic fatigue, diabetes, and peripheral neuropathy. All of these conditions are related to immune dysfunction caused by inflammation. For this reason, researchers theorized that inflammation may be the trigger in restless leg syndrome. Once statistical data was gathered, researchers found that there are 38 diseases considered highly related to restless leg syndrome. 95% of these diseases have an inflammatory basis. This suggests that inflammation plays a much larger role in the onset of restless leg syndrome than previously known. It’s also possible that inflammation can affect other factors that are linked to restless leg syndrome by previous studies. For example, inflammation is known to trigger iron deficiency – another suspected factor in the onset of this condition. Another focus in restless leg syndrome studies is the microflora in the gut. The gut and its microflora are the nerve center of the immune system, and directly control immune regulation. Imbalanced bacteria levels in the gut may trigger inflammation that can lead to restless leg syndrome. Based on cumulative research and several trigger theories for restless leg syndrome, nutrition should be incorporated in every RLS patient’s regimen. 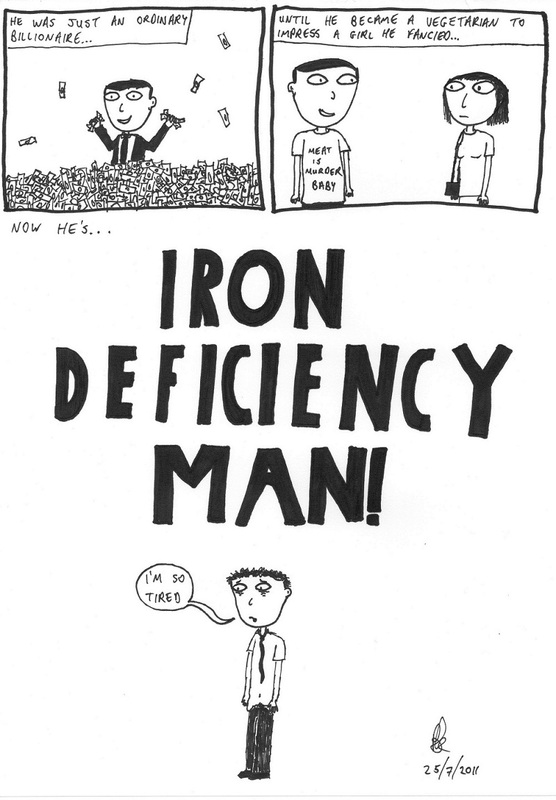 For example, ensuring that iron deficiency is not present is an important preventative strategy. 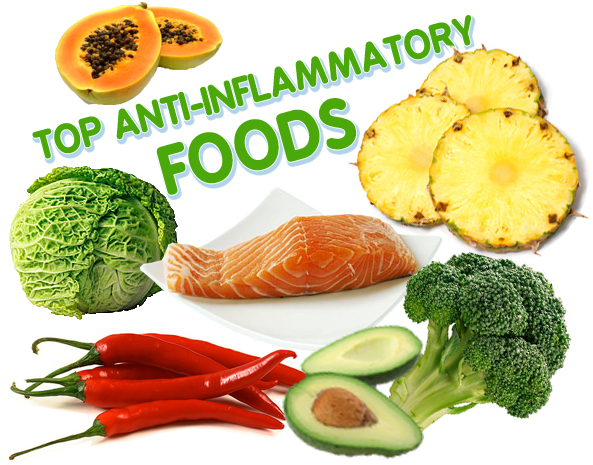 Eating a diet rich in foods known to combat excessive inflammation is also a good idea. Taking natural, anti-inflammatory supplements (not NSAID’s) will help to calm existing inflammation as the beneficial effects of nutrition therapy begin to take effect. Anti-inflammatory foods include fruits and vegetables that are rich in color. Cherries, peppers, walnuts, fatty fish, berries, beets, tomatoes and dark leafy greens all contain high levels of antioxidants and essential nutrients for immune regulation. Because there is evidence to support the role of inflammation in RLS, controlling systemic inflammation should be of priority as researchers continue to understand this baffling condition. Furthermore, controlling inflammation through the use of natural supplements and nutritional therapy should take precedent over invasive strategies like sedatives or prescription medications that can be habit-forming. “Practical Help to Relax Those Restless Legs Without Drugs” by Dr. Scott Saunders, MD. Merton came in to my office complaining that he couldn’t sleep. He was tired all day, falling asleep every time he sat down. After some discussion, we found the reason for his sleeplessness: his legs wouldn’t relax, he consistently felt he needed to get up and walk, or move around, all of which is known as Restless Legs Syndrome (RLS). Sometimes, this would wake him up in the middle of the night and he just had to get up and move. The problem had gotten worse since he had quit smoking. When he smoked, he found if he could just take one long drag and hold it in, then the feeling would go away. We tried many remedies, including sleeping pills and natural sedatives, but nothing worked. I was ready to throw in the towel and tell him to take up smoking again, until I thought that his problem might be related to something in the tobacco – nicotine! Nicotine in tobacco can increase dopamine in the brain and “treat” some people with RLS. First of all you should avoid stimulants such as sugar (yes, it’s a stimulant), MSG and caffeine. Especially avoid energy drinks. The ability for muscles to relax requires a proper balance of sodium and potassium, as well as calcium and magnesium. Mostly, we get enough sodium and calcium, but not enough potassium and magnesium. These can be taken as supplements, but I always recommend using foods first. 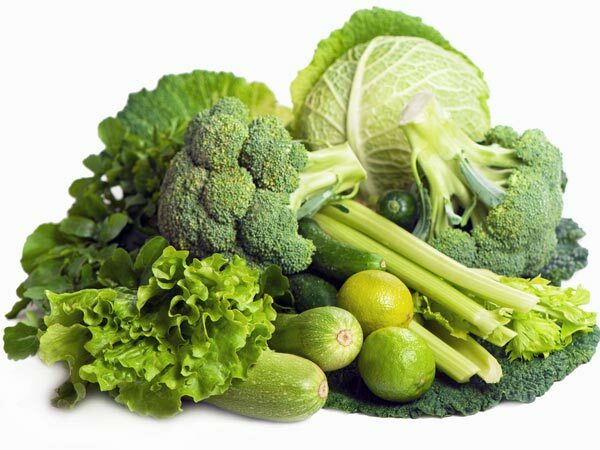 Many are amazed at how their restlessness disappears when the eat greens as a significant proportion of their diet. You have probably heard that bananas contain lots of potassium, and they do, but most other fruit does as well. These are best eaten fresh a nd raw so the oils aren’t oxidized. When grain is processed, the magnesium is removed. I recommend avoiding all processed grains for many other reasons also. The modern diet has a tremendous imbalance of oils. Those with Restless Leg Syndrome have significantly lower levels of essential oils and vitamin E.
RLS connection. This regulation allows the muscles to relax normally. Recommendations: Eat fish or flax seeds or take flaxseed oil or fish oil 5 grams per day. Take “Mixed Tocopherols” or natural vitamin E 600 IU per day. Vitamin B3 is an important part of energy production. 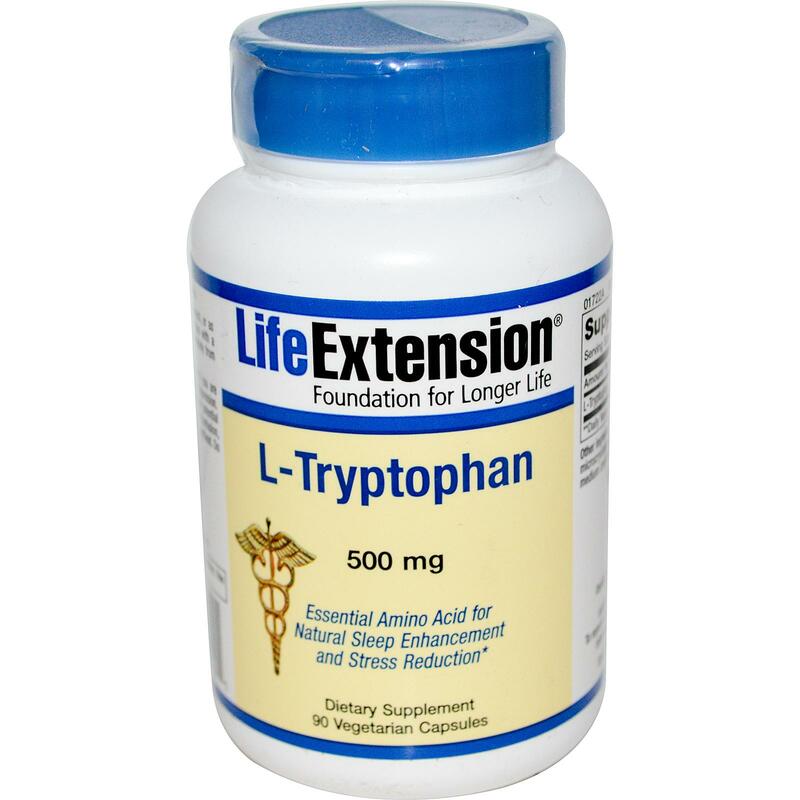 Moreover, having this vitamin in sufficient amounts is important for the production of Serotonin, which is made from L-Tryptophan and has a calming effect on the brain. Recommendations: Niacinamide, 500mg three times per day with meals and L-Tryptophan 2000mg at night on an empty stomach. this problem may need up to 30mg of folic acid per day. Recommendation: You must use the amount required to relieve the symptoms, adjusting the dose as needed. You may also find that you need considerably less if you get the activated form, called MTHF (methytetrahydrofolate or methylfolate). Studies indicate iron to be a major player in RLS because it is needed to make dopamine. Most people who suffer from RLS either have low total body iron, or just in the brain. Be careful with iron supplementation because too much iron causes inflammation. Ideally, you would want a test of iron levels before taking extra. Recommendation: Supplement iron with an iron nail (16-penny NOT galvanized) clean it off with sandpaper or steel wool and put it into an orange. The next day take it out and eat the orange. Put the nail in the next orange. The following day take the nail out and eat the orange, putting the nail into another orange. Continue with this daily. Within one week you should have noticeable improvement. If not, you probably don’t need iron. There isn’t just one “cure” for Restless Leg Syndrome. Merton finally found relief when we increased his dopamine levels and slept like a baby. If you feel like you need to move your legs you might consider the above natural treatments: calcium, magnesium, potassium, iron, folic acid and vitamin E.
It may take some trial-and-error, but it’s worth avoiding drugs and getting a good night sleep. 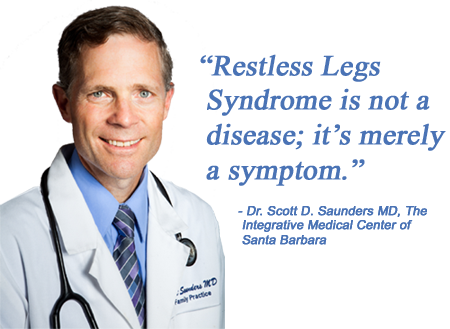 Dr. Scott D. Saunders, MD is a practicing physician, specializing in preventative healthcare, who utilizes eclectic health care for the whole family, including conventional, orthomolecular and natural medicine. He is also the medical director of The Integrative Medical Center of Santa Barbara in Lompoc, CA. He went to UCLA medical school and is board certified in family medicine. This article is based on a lecture from the XLVII European Renal Association-European Dialysis and Transplant Association Congress. Dr. Romano noted that several studies have shown that increased inflammation is associated with elevated cardiovascular risk in patients on chronic hemodialysis. Also, he said there is evidence that sleep disorders induce elevated levels of proinflammatory cytokines. “We think that if patients have some sleep disorders, they evoke inflammation,” he said; “if we treat the sleep disorders, we reduce a cardiovascular risk factor because CRP is a possible cause of increased cardiovascular risk.” The hemodialysis patients without RLS, he noted, had much lower CRP levels. Similarly, the levels of transferrin saturation, another marker of inflammation, were different between patients with and without RLS. 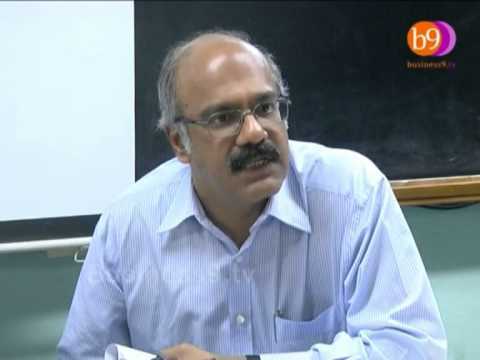 Nageswara Reddy, MD, assistant professor of nephrology at Manipal University in India, who was not involved with the study, told Medscape Medical News that it makes sense to him that RLS is associated with inflammatory markers. Cardiovascular mortality, which is the main cause of death among hemodialysis patients, is associated with elevated levels of CRP, but it might be associated with other underlying causes as well. 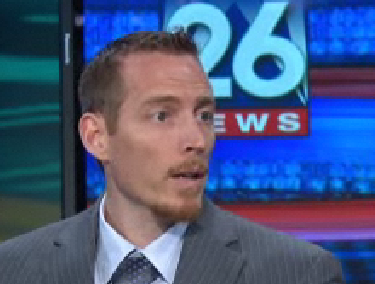 “We have to find out all risk factors. Maybe lack of sleep is another risk factor,” Dr. Reddy hypothesized, and suggested that other inflammatory markers, in addition to CRP, be investigated.